It’s been six months to the day since Maya died. She has given me the most thorough education on death and dying in horses. I had no idea what I was in for. 1. I can be in pain and still be happy to be alive. 2. Just because I’m in pain does not mean I want to die. 3. No need to fix. 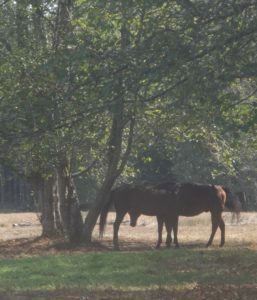 After a horse has died, leave the body on the property for a couple days and allow access for the other herd members to do whatever they need to do. This will hugely benefit the natural grieving process for both the people and the animals. 4. Allow dying to happen on its own time frame. If a horse has not died yet, but is dying, support the dying process, but you do not need to expedite it. Why has an animal not died yet? You’ll have to ask them. They likely have unfinished business we are unaware of. 5. Just show up and be. 6. Educate yourself about what dying looks like. Then when you witness it, you’ll understand what is happening. When you understand, you can then be of service to the horse. 7. Massage, acupuncture points and Ttouch ear slides can be helpful. Massaging above the eyes can be helpful for managing pain holistically, even debilitating pain. 8. Aromatherapy with essential oils can be helpful. Lavender can have a calming effect. Frankincense can help with the transition process of dying. Flower essences on the tips of the ears is another helpful option. 9. Practice breathing, relaxing and feeling the ground. Practice allowing what is happening. If you believe in God, ask God to help you. You are holding space for a natural process. There is no need to fix it. This is the transition every being on earth will take at the end of their life. It is sacred, and every being’s process will be unique. By honoring their unique process, you are honoring them. 10. Find support ahead of time of people who share your views on death and dying, so when dying begins to take place, you will know who to call to support you in witnessing the dying process. You do not need to do this alone. Trust your instincts and your relationship with your horse, even if it differs from other people’s opinions. Give the best that you have. Nothing more and nothing less. This is love in action. Someone told me once, you don’t necessarily have to fix the pain, and maybe you can’t fix the pain, but you can be present with someone in their pain, and that is a gift. A few days before Maya died when we were trying to figure out how to best help her, there came an evening where there was nothing more to do, but wait until morning. 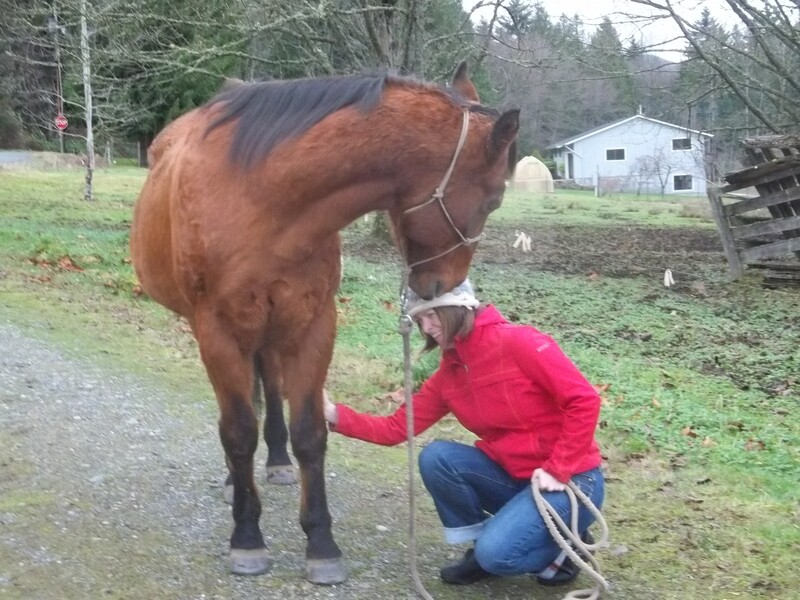 I gathered up all my tricks that I had learned over the years of rehabbing old horses and put them in my pockets. 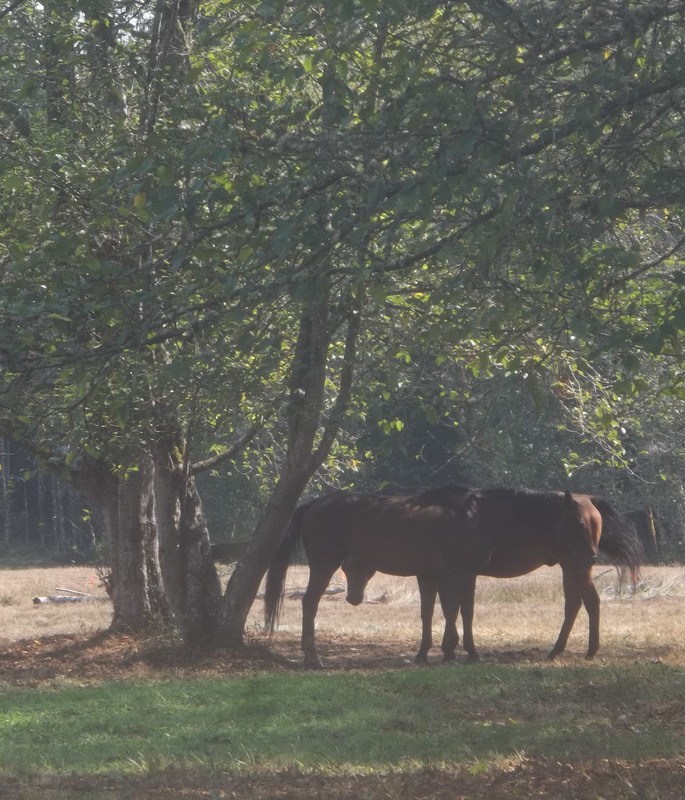 I headed out in the dark, the moon just beginning to rise, to find Maya in her usual spot under the trees, hanging out with my other horse who she became instant friends with. They were in very close proximity which told me that, yes, they are friends, and also that she was not feeling that great. I pulled my tricks out of my pockets one by one to see which ones she wanted. She said yes to one lick of yucca, which is a pain relieving herb. She was agreeable to flower essences on the tips of her ears. She enjoyed the Ttouch wraps so much that she fell asleep. I did a little energy work, and then prayed over her. After a long time, when she was ready to go eat, she slowly meandered off. I was glad that she still had the energy to let me know when she didn’t want anything more. That evening I couldn’t fix the myriad of health issues going on, but I could acknowledge her and be with her in her time of need. It is moments like these that I cherish. 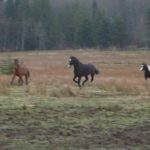 Do Horses Have Emotional Lives? 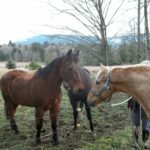 When I got back into horses as an adult, I volunteered for several years at an equine therapy program for at-risk youth and teens in drug and alcohol recovery. The horses did a great job helping these kids learn how to make positive, healthy choices in their lives. 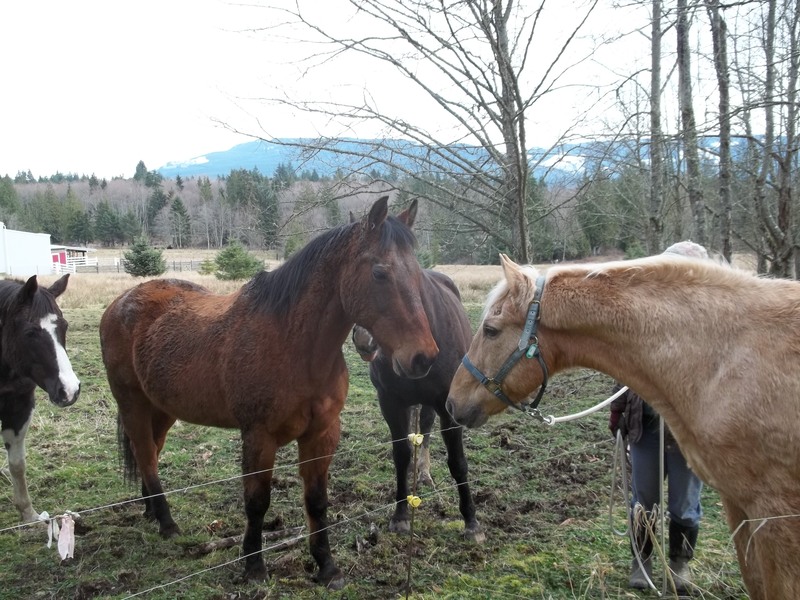 The horses were so good at it that I didn’t realize they had emotional needs themselves. 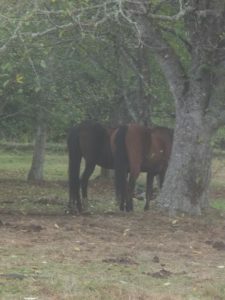 Yes, they had their basic physical needs met, like shelter, food and water, and they had some emotional needs met in that they lived in a herd and were not confined to a stall. But I had no idea they had an emotional life of just being a horse that had nothing to do with the people they were helping. 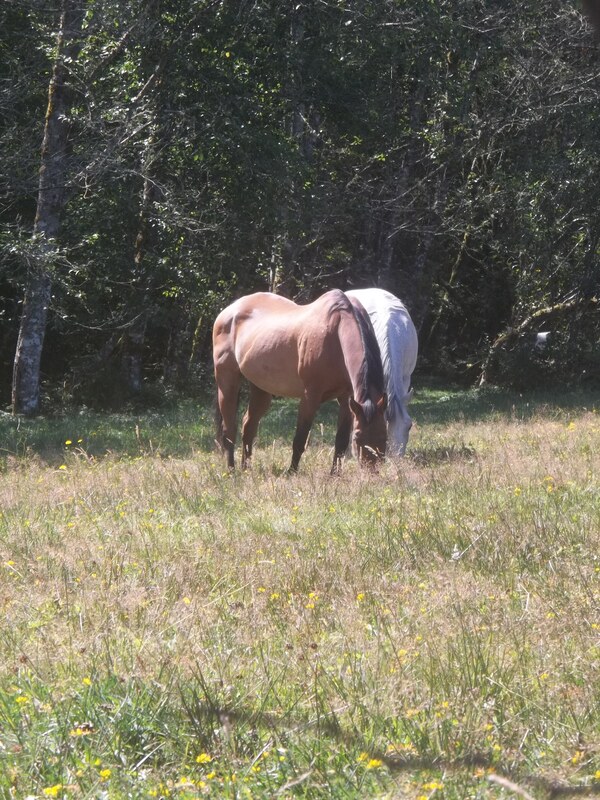 When I took in Chaco, my first senior horse retiring from therapy work, he was burned out. How did I know he was burned out? He had always been a hard keeper, but it started to get even more difficult for him to maintain his weight. But even more than that, he was also a docile horse that never bit or kicked. When he started a pattern of biting people, that is when we knew he was burned out. Knowing that physical and emotional needs are intertwined, I began with revamping his diet to optimize his nutrition on the physical side. To attend to his emotional needs, I put him on acreage with space to move day and night in a herd. As he became healthy and his curiosity returned, I realized that there was much more to his emotional life. In his state of new health, I now had something to compare to when he had an off day. If his demeanor was different on a particular day, I could look around and consider what changed in his environment that might affect him. When one of his pasture mates died a few years later, his demeanor was visibly different for 2 weeks. 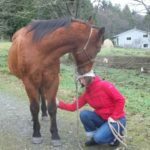 It was then that I realized this was an emotional issue, and it was on a scale I had never witnessed before in a horse. This experience introduced me to flower essences. While his demeanor over the first week improved with the help of flower essences, he still wasn’t quite his usual self. I tried to think of who might be able to lift his spirits. My sister came to mind. The first time they had met, they instantly hit it off. When she came and spent the day with him, his eyes brightened and his curiosity returned. It was a positive turning point for him in processing the loss of his horse friend. The emotional lives of horses. If it still seems outside your experience, spend time watching them and being around them where they are free to be themselves and you are not asking anything of them. After years of observing and comparing different experiences, I can say that I have seen JOY in Chaco. I have seen GRIEF in Chaco. I have seen SADNESS in Chaco. I have seen EXCITEMENT in Chaco. I have seen FEAR in Chaco. I have seen PANIC in Chaco. I have seen ASTONISHMENT in Chaco. I have seen APPRECIATION in Chaco. I have seen CONTENTMENT in Chaco. I’m sure there is still more to Chaco’s life as a horse that I will come to understand over time. It’s like a great mystery novel. I can’t put this book down. It keeps getting better with every page turn. It was another typical day with my horses. As I was feeding in the morning, I noticed the barn cat in the yard, a regular hunter of mice and rabbits. About an hour later he took up a perch near the top of the driveway next to the road. I found that unusual, but didn’t think anything of it. I haltered my horse, Chaco, to take him for a walk, and as I walked him up the driveway I noticed a rabbit in a frozen position, his hind legs stuck in the fence. I assumed he was dead and figured the cat would eventually have him for lunch. Chaco and I took our time at the top of the driveway, sort of curious and at the same time not wanting to look too closely at a dead rabbit. While we were at the top of the driveway trying to figure out why the cat hadn’t done anything yet, we heard a commotion in the neighboring maple tree and the sound of big gusts of air. Suddenly, overhead, just 15 feet above us, were the huge yellow-gold claws of a bald eagle. It startled both Chaco and I. Wow! Those claws and legs were huge. I had no idea. With the eagle gone we continued down the road for our walk. Upon our return the bald eagle was standing in the grass cautiously walking very slowly toward the dead rabbit when the cat came out hissing with its back arched and hair raised. The eagle started to posture and then flapped his wings, moving back a few steps. Undeterred, the cat did not back down and the eagle left the rabbit where it was, stuck in the fence. About an hour later I was about to leave when Chaco left his hay and walked to the far end of his paddock and pointed his body in the direction of the dead rabbit. This was unusual behavior for him so I stood with him watching the dead rabbit. As I stood there I asked, “What are you trying to tell me? Is the rabbit alive?” Sure enough, after a couple of minutes of watching the rabbit, I saw what Chaco saw. There was a twitch of the rabbit’s nose. The rabbit was alive! I knew then that I needed to unhook this rabbit from the fence, and hopefully he would hop off. As I looked for a way to loosen the wire, Chaco watched me intently everywhere I went. I found a shovel and scooped up the rabbit’s front legs and gave him a little push backwards, and he was free! However, to my disappointment, he didn’t hop off. I put a drop of Rescue Remedy on the end of a piece of straw and touched his ears with it, hoping that maybe that might bring some energy back to him. And yet, I also saw the injury to his hind leg, and perhaps that was why he was not hopping off. There was nothing more I could do. Even the wildlife rehabilitation center I contacted agreed. With sadness in my heart, I told the rabbit I was sorry. I knew what was coming. Within hours the eagle won, and the rabbit was no where to be found. The cat went back to hunting mice, and Chaco had gone back to eating his hay. And me, I wanted a happier ending, but I also respected that the rabbit was a wild animal and part of the cycle of life where life and death coexist. Mother nature took its course, and I was the only witness to the convergence of this rabbit, cat, eagle and horse. Years ago I had heard of Rescue Remedy and the Bach Flower Essences. I had never had a reason to use them or investigate them further, until I had horses. A holistic vet told me that flower essences can be useful with emotional issues in animals. At the time they were completely outside my experience, and a little too “woo-woo” for me. Emotional issues and animals? Well, okay, but I kept the idea on my back burner for future reference. 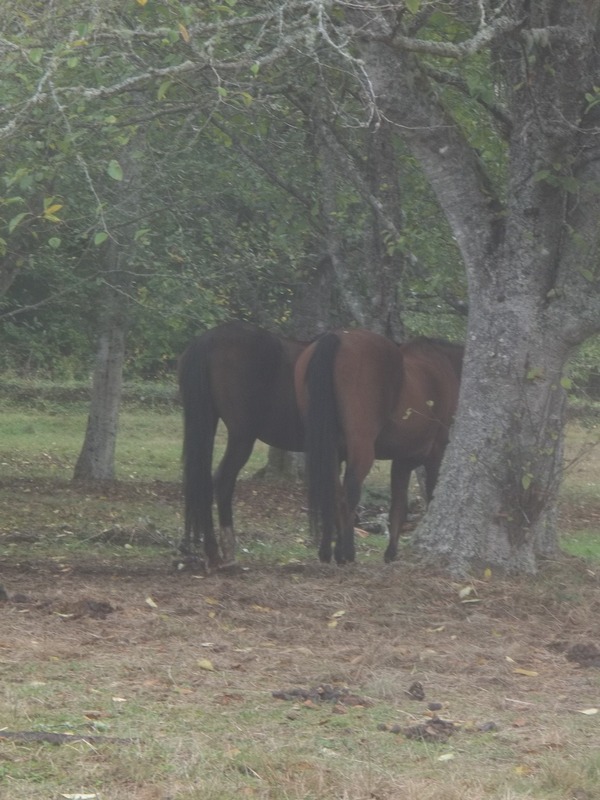 When it came to the well-being of my horses I would consider it when the time arose. 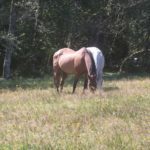 When my horse’s pasture mate died of colic, that time came up. My horse’s demeanor was visibly different for days. He just stood in the corner of the field away from the other horses with a low head and sad look in his eyes. He looked depressed, and there really wasn’t anything I could do to fix the situation and bring his horse friend back. Then I remembered, “Flower essences!” Maybe they could help. I pulled out my animal wellness collection of 23 different blends of flower essences. 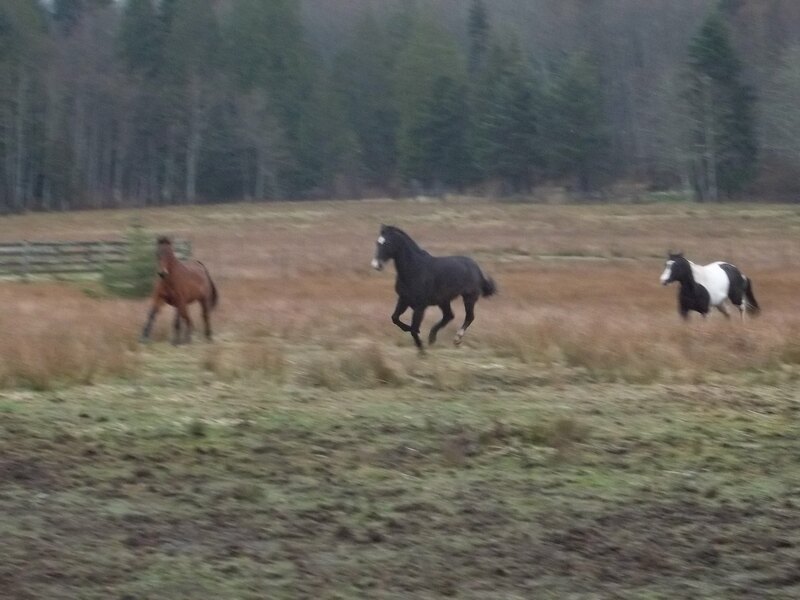 (Yes, they were a little woo-woo, but if my horse indicated he wanted them then who was I to argue)? I chose a couple of different blends like “grief and loss” and “transitions”. I put them in my pocket, and then went out to see my horse. Without me looking at the labels, I let him sniff each one. On some he turned his head away. I took that as a “no”. On others he tried to nip them out of my hands. “Okay,” I thought, “I guess you want those.” I placed a single drop on my fingertips and touched the tips of his ears with it. Then he did something he’s never done before, or since: He licked it off my fingertips. Twice that week he wanted the flower essences I offered. Then on the third day, he no longer wanted them. While I don’t fully understand flower essences, I do trust my horse’s instincts, and I’m more than happy to let him tell me what he wants. The bonus for me is that I get a little glimpse into his world of being a horse, and I come to understand him that much more.